Don’t Miss The Next Best of the Fest! In the oft-cited history of American music, there is a missing chapter that deserves our attention and respect: the influence of Native Americans. Despite attempts to ban, censor, and erase Indian culture in the United States, indigenous musicians played an important role in helping to shape the soundtracks of our lives. Many early pioneers of the blues had Native as well as African American roots. And as the folk rock era took hold in the 60s and 70s, Native Americans helped to define its evolution. Rumble tells the stories of these iconic Native musicians through playful re-creations and little-known stories, alongside concert footage, archives, and interviews with some of America’s greatest music legends who knew them, played music with them, and were inspired by them. 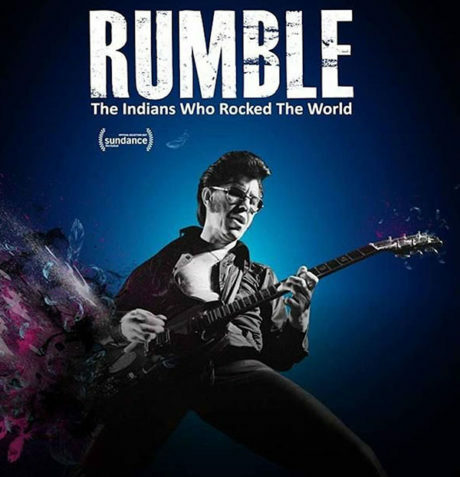 Featuring some of the greatest music stars of our time, the film reveals the important – but rarely acknowledged — impact of indigenous musicians on the American music scene. Pay What You Can / ALL Donations appreciated! Malcolm Suttles, FHFF Board Member and projectionist extraordinaire, was so inspired by this film, he is setting up his own sound system for this screening.